I like the West Palm Beach Freakbike Militia folks (referred to hereafter as FM because I manage to misspell Militia and have to keep correcting it) and they tolerate me hanging around, so it’s a good mix. Remember their Summer of Love Ride? These folks know how to have fun. When TIII sent out a message that there was going to be a 48-hour bike build at the Hen House, I sort of wangled an invitation. Another naming convention: I know that most of the FMs have birth certificates somewhere with real names on them. They prefer to go by nicknames like Wet Paint, Accident, Banjogrrrl, KrusherZ and the like. One of them mentioned that it has to do with parole officers, but he was kidding. I think. 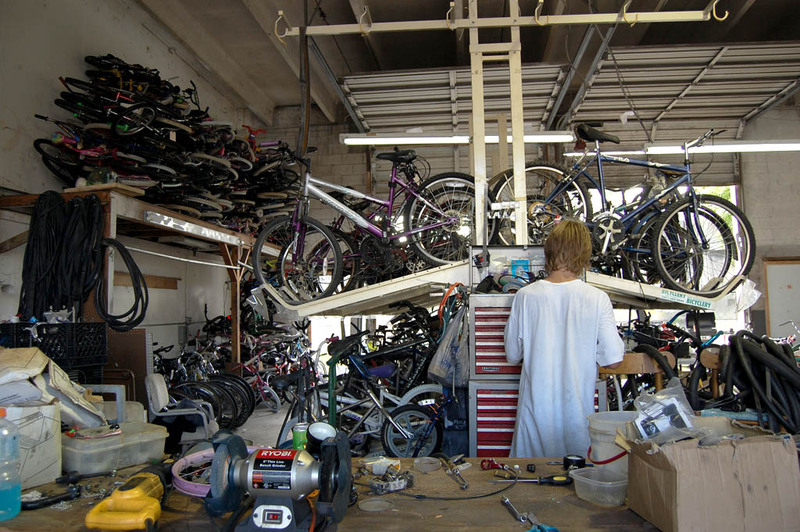 The Hen House is a storage unit in Lake Park where volunteers work on restoring bikes for Jack the Bike Man. You can read all about Jack, his organization and his projects here. Jack told the FM that he had to move to a smaller place to cut down on rental costs. Empty and remove a huge rack in the middle of the shop, all to prepare for the move. Drinkslinger, in the red shirt, came down from Melbourne and worked at least 40 of the 48 hours. He was cranking out bikes every time I looked at him. When he wasn’t building them himself, he was showing others how to tear apart and rebuild old clunkers. 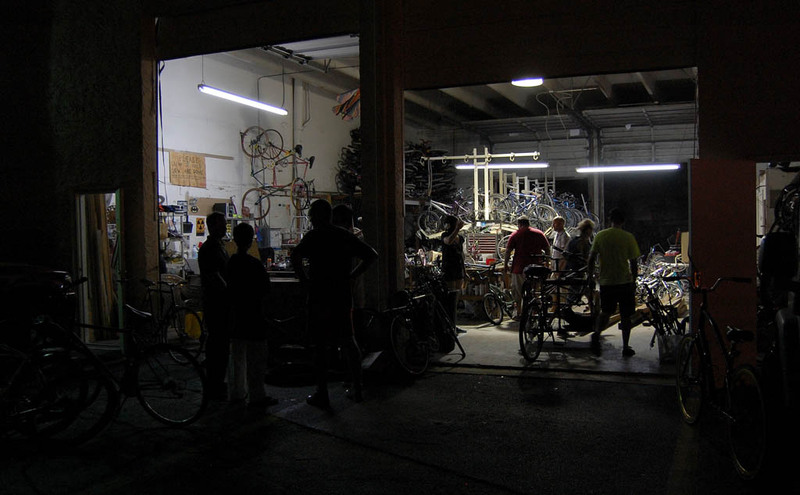 Ricky, in the white shirt, had already knocked out seven or eight bikes when I saw him the next morning. Freakbikers do more than just party and build funny bikes. 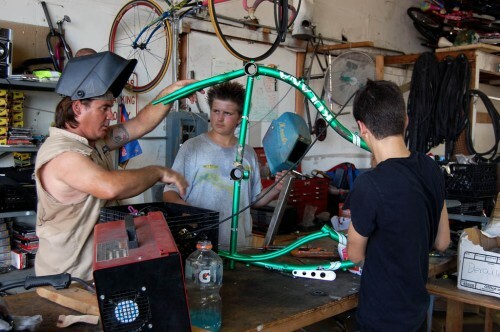 They spend a lot of time working with high school-age kids like Rand, one of KrusherZ’s neighbors. TIII is showing him the finer points of tire valves here. And cool teachers who do this because they love it. When the crew needed a break, they’d pull out their own pet projects to work on. There are tall bikes that are eight feet tall; and low riders that almost drag the ground; bikes that look like they have scales and bikes that shoot fire. Imagination and the laws of physics are the only limits. These are not your *-Mart’s Huffy bikes. They may be MADE of discarded *-Mart bikes, but that’s the end of the resemblance. KrusherZ, left, Wet Paint and Accident are starting to work on a tall bike. Putting a bunch of young males (and some who are not so young) in a room with instruments that cut and make sparks pretty much insures that blood will be spilled eventually. Parental warning: Nothing REALLY gory happens, but there IS one brief, if understandable, use of profanity in the video. Tony was using a grinding wheel when he discovered that the spinning blade takes off flesh faster than it does metal. Fortunately, the Hen House stocks first aid supplies. After a debate about which of those supplies to apply first, KrusherZ produced the REAL first aid. “Icy pops fix EVERYTHING,” he said. The last time I saw KrusherZ and Tony, they were headed off to KrusherZ’s house where Super Glue was available. Do I REALLY want to run this video? I sent a message to ask Banjogrrrl if she thought anyone would take offense at the Freakbike Militia First Aid video. So, Tony, if you have a grinding wheel in your hand the next time we meet, I want you to remember that it was Banjogrrrl who said that, not me. This sounds like a great group of cyclists. It’s these kind of bike riders who need more publicity so that folks in cars might change their attitude towards all of us out there on the streets. Liked the video of building the bike, but I guess your ghoulish side kicked in once the “accident” occurred since we never saw anymore of the bike build. You weren’t tempted to grab a cutting torch and try out some custom work? Just imagine what you could go to your SLHT once you master adding on MORE tubing!! 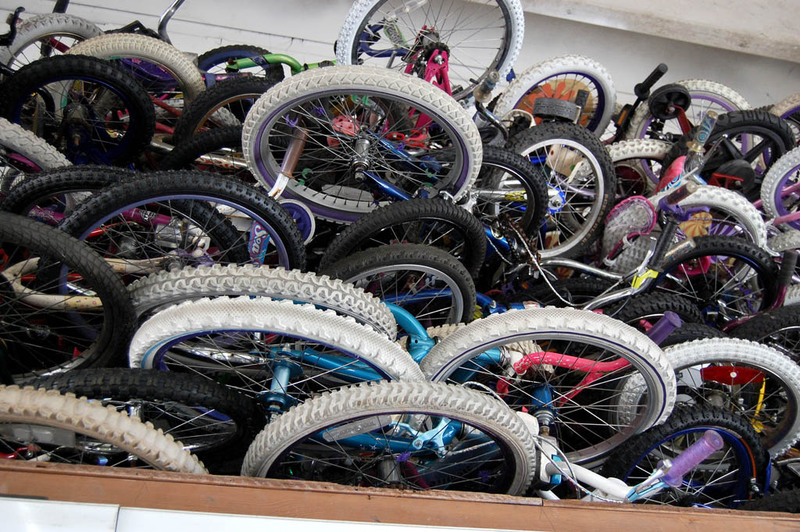 Would like to see how the bikes are handed out during the holidays if you can be there for it. You worked for TV. If it bleeds, it leads. I’ve even got a certain amount of street cred with these guys. When I was being introduced to someone I had never met before, he asked what kind of bike I had. When you can impress FMers, you KNOW you have a special bike. I’m going to see if I can get KrusherZ to help me put flame throwers on my bike like he has on one of his. I bet I won’t have any trouble getting drivers to obey the 3-foot rule after that. That’s awesome! I love Krusher. Hope to see you at the Halloween event, make sure your card is empty, there are some really neat things to see and photograph on the Mother of all Choppernites! I may be back in the Midwest on vacation then, but if not, I’ll sure be there. If it’s half as much fun as the Summer of Love ride, it’ll be a blast. Great write up on the FBM… Thanks again…. Thanks. I can’t take that much credit. “F/8 and be there,” was his answer. Shooting the FBM is kind of the same way. All you have to do is stand there and something crazy is going to happen. Wow amazing advocacy bravo. I’m glad that there are people also who are very passionate on giving something specially for the kids in need. I really admire this kind of people. I’m sure a lot of kids out there will be very happy when they receive the bike.